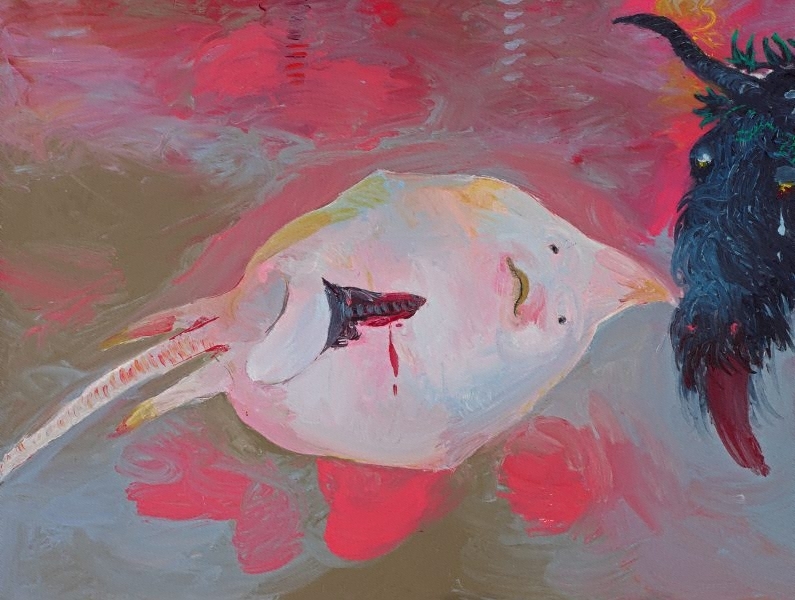 First exhibited at the Venice Biennale in 1988, this painting is perhaps one of Arthur Boyd's most difficult and bewildering works of recent years. Recalling something of his own iconography of the 1940s, when he drew a woman on the beach at St Kilda walking a paralysed dog by holding its back legs like a wheelbarrow, Boyd has transformed this image into a parody of the Australian first world war soldier Simpson and his donkey. 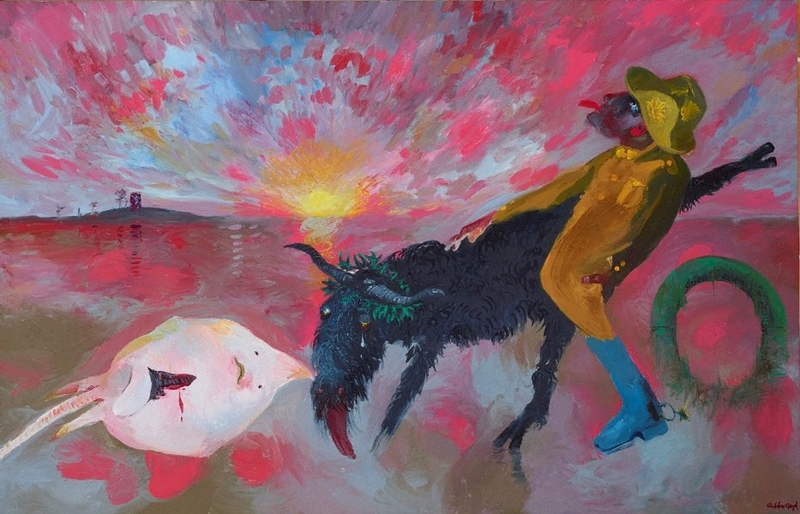 The hybrid symbolism of dog-beast-victim has appeared in various forms in Boyd's compositions over some four decades. The green tyre of a polluted landscape, the destroyed innocence of the day ray fish: these underline the artist's recurring statements about the futility of conflict which always seem to be happening in some part of the world and about the desolation which inevitably follows. The title itself was derived from that of a book by the late contemporary English art critic Peter Fuller who, during a car journey to north-west Australia in 1984, was reminded of the scene of Holman Hunt's famous work 'The scapegoat', set on the shores of the Dead Sea. Fuller saw Hunt's image as a reflection of the barrenness of the European landscape tradition whose resurrection might be possible in the mythic spaces of Australia. Boyd has created his apocalyptic vision in violent slashes of colour exploding from a sun rising out of the storm-ravaged landscape of Suffolk where he lived when not at Bundanon on the south coast of New South Wales. Thus the scene of this work could be interpreted as two places: the distant tower being the church which the artist can see from his studio window in Suffolk; or the water tower at Nowra near his home in Australia. Signed l.r., red oil "Arthur Boyd". Not dated. Bruce James, The Sydney Morning Herald , 'Light fantastic', pg. 11, Sydney, 02 Sep 2000, 11. NOTE: page 11 of Spectrum lift-out. Review of 'Australian Icons' exhibition. 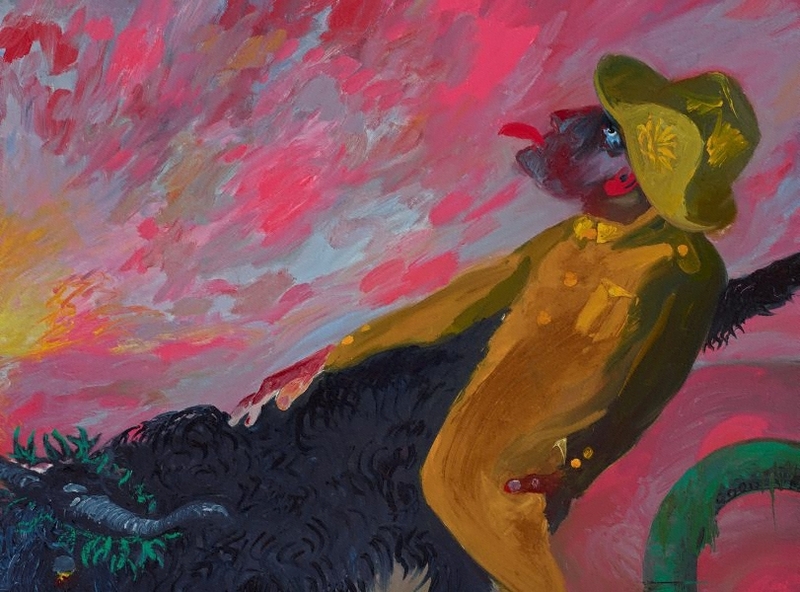 Arthur Boyd: Art and life , 'Landscape transformed through painting: late works', pg. 156-197, London, 2000, 190-191 (colour illus. ), 192, 195-196. Australian painting 1788-1990 , South Melbourne, 1991, front cover (colour illus. ).